Simply link your Wikiloc account to your Garmin connect. 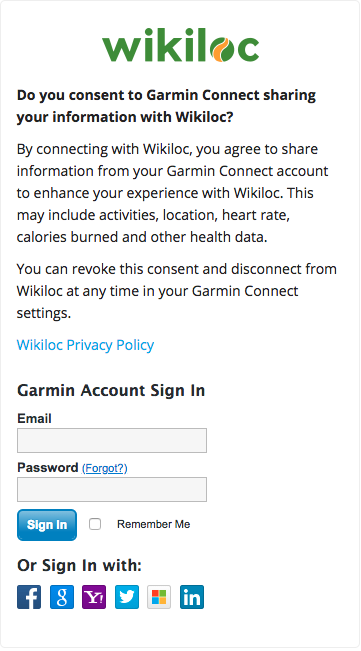 From then on, every time you send a trail to Garmin Connect it'll be uploaded into your Wikiloc profile. In some cases , you'll need to enter your Garmin Connect username and email. 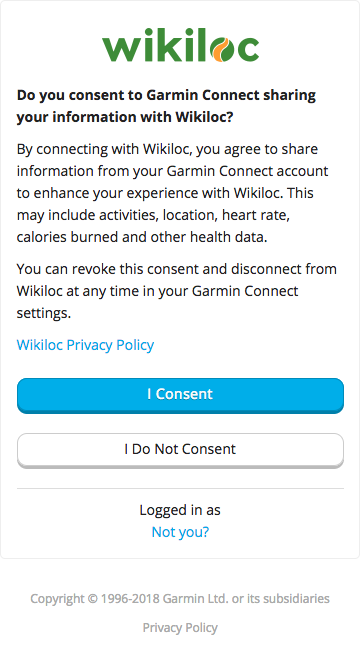 The Garmin Connect screen will open asking you to authorize Wikiloc. Choose "Authorize". Once the process is complete, you'll see a confirmation message in your Wikiloc profile. From now on, when you upload a trail to Garmin Connect it will appear in your Wikiloc account! Synchronization between Garmin Connect and Wikiloc can take between a few seconds and a few minutes. Usually, in less than 5 minutes, your trail will appear on your Wikiloc profile. In Wikiloc we respect and maintain the privacy that you have selected in Garmin Connect for your trail. It's common to share the routes as public in Wikiloc, and to do so you have two options: Change the privacy in Garmin Connect or edit the trails once posted in Wikiloc and make them public. While editing your routes it is a good opportunity to give by adding a description in the trail, as well as add photos. At any time you can unlink your Garmin Connect and Wikiloc accounts and stop synchronizing the trails you upload to Garmin Connect. You can do it from the configuration of your personal profile on Wikiloc. The first time you link your Garmin Connect and Wikiloc accounts, Garmin sends the trails you've made the last 30 days. This transfer is automatic and, normally, instantaneous, although on some occasions it can take some days.